The Arctic Circle is known for many things, namely Santa Claus, the Northern Lights, long summer days and endless winter nights. 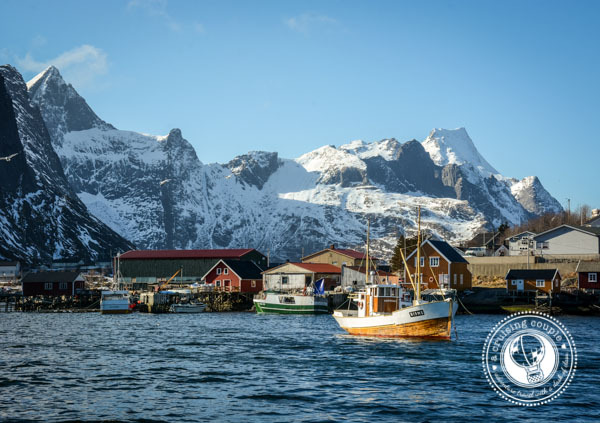 But sitting 100 miles north of the Arctic Circle also lies a surprising island paradise and one of Norway’s most scenic destinations: the Lofoten Islands. The Lofoten Islands are harsh and dramatic, with tumultuous weather conditions and craggy mountaintops that tower above icy water. 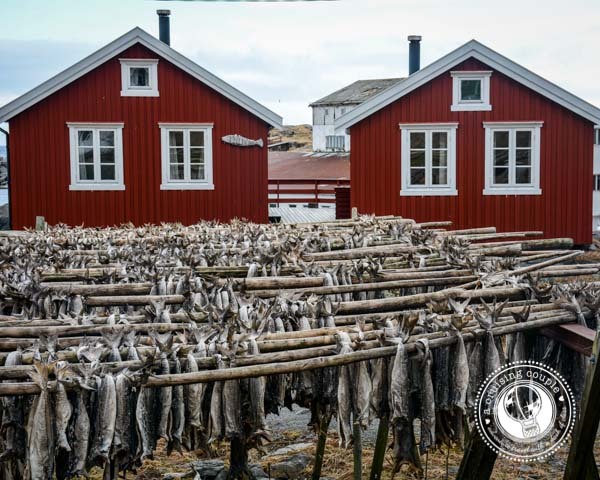 But despite the archipelago’s rugged nature, there are also plenty of charming details, such as the traditional stark-red fisherman cabins, the rows of codfish hanging out to dry, and the boats that slowly sail through the fjords to deliver mail to the area’s unlikely inhabitants. 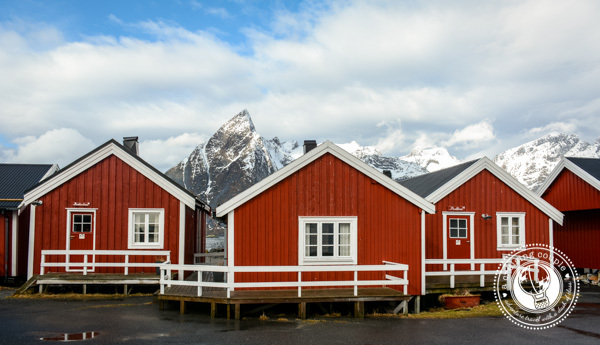 Rorbuer are the traditional red fisherman cabins that dot the islands. Typically you’ll find them in groups, with one end firmly planted on land, the other end suspended by polls in the water. Some of the rorbuer are still used by fisherman in Lofoten, though now they are primarily used to rent out to tourists. 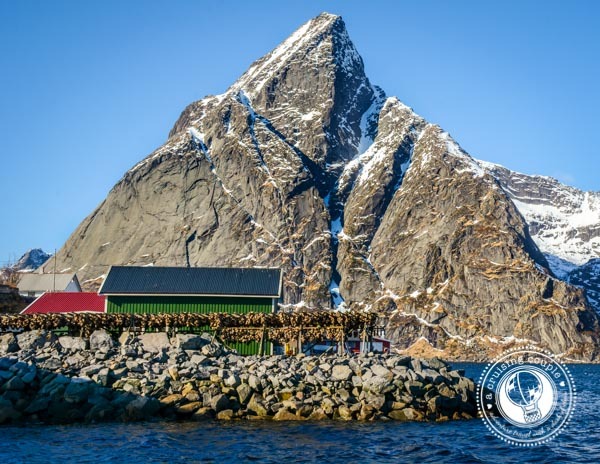 Eliassen Rorbuer is the oldest fishermen cabin village in Lofoten, located on the teeny tiny island of Hamnøy. This is where we stayed in Lofoten, and we could not have imagined a more ideal place to base ourselves. Though the cabins are still named after the original fishermen that used to call them home, the rorbuer have all been renovated, combining old-world charm with modern amenities. It was just the two of us, but our cabin had ample space with: two bedrooms, a loft, a fully equipped kitchen, a large bathroom with heated floor and a comfortable living area. Eliassen Rorbuer is just a fifteen-minute bike ride from Reine, said to be one of the ‘most beautiful places in the world’. 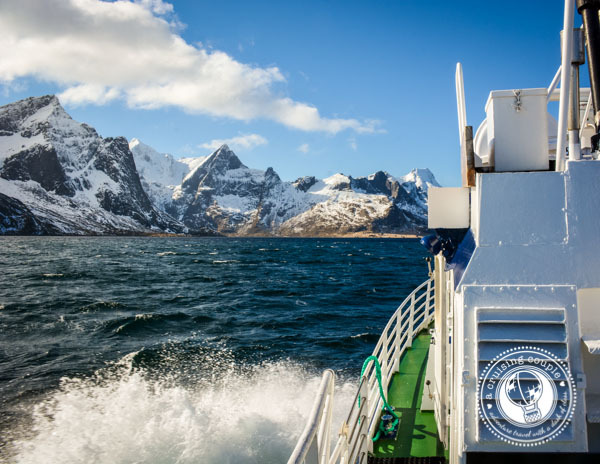 But Hamnøy itself is a magnet for photographers, and one of the reasons why we chose Eliassen Rorbuer in the first place. Even with the horrible weather, we enjoyed a few nights of cooking dinner, drinking wine, and enjoying the majestic views of the surrounding sea, mountains and Reinefjord from inside our warm cabin. We might have even caught a glimpse of the Northern Lights from the couch one night, as both of us noticed a green haze extending out from the horizon. 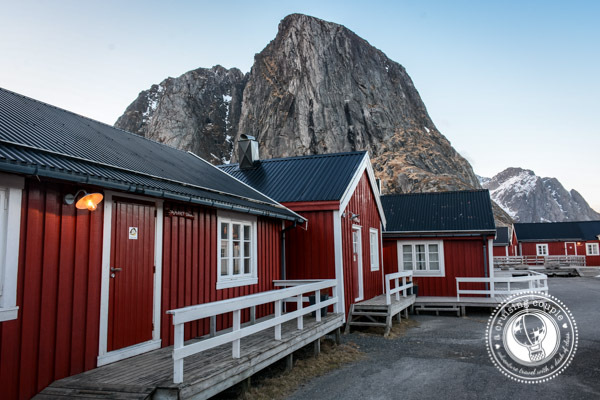 Eliassen Rorbuer isn’t a hotel—it’s a cabin, and as is typical of renting cabins in Scandinavia, you are expected to pay extra for bed linens, tidy up after yourself when you leave, etc. 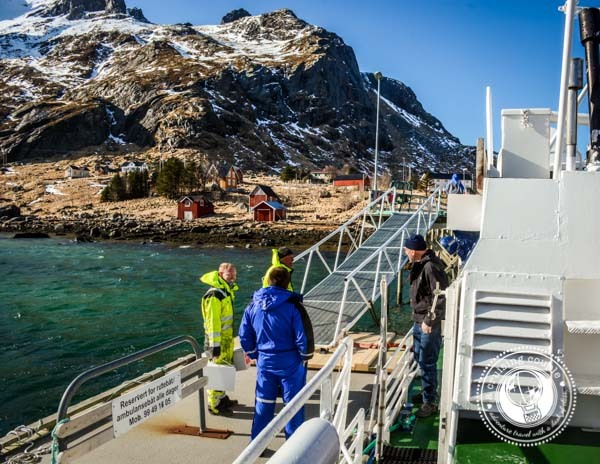 However, the manager is extremely helpful and able to answer any questions about Lofoten or the cabins you might have. Kayaks are available free of use, or you can also arrange bike rentals, fishing boat rentals and other tours. The E10 highway connects the Lofoten Islands. Though it is possible to use bus transport to get from place to place along the route, having your own car will make a world of a difference. One of the best things to do in Lofoten is just drive around the islands, stopping to take photos as you please (which is about every five seconds, if you’re us). Eliassen Rorbuer has free parking for guests, and with a car it is just moments from some of the best hiking, climbing, and cycling on the islands. Unfortunately we didn’t have our own vehicle, but we did befriend a wonderful couple also staying at Eliassen Rorbuer that offered to shuttle us around the islands with them. The difference in the freedom and flexibility we had driving with them versus taking the bus was astronomical. 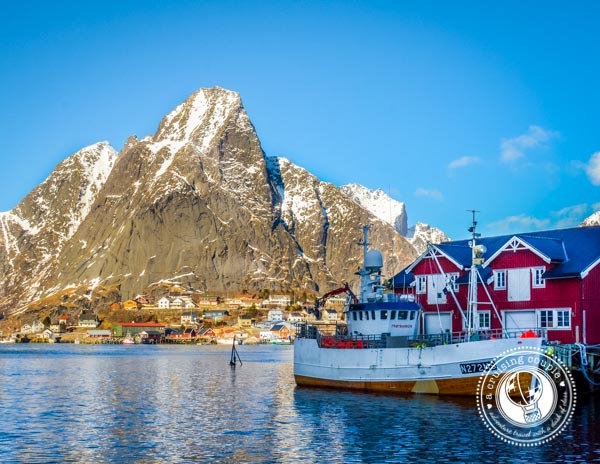 Reine is as picture-perfect as small Norwegian fishing villages come. We walked to Reine, we cycled to Reine, we drank coffee in Reine…we even took a short boat ride through the Reinefjord. Being so conveniently located just south of Hamnøy, we found ourselves returning to this quaint and colorful town again and again. If we’d had better weather, we also would have indulged in the nearby hiking, kayaking and beach going. 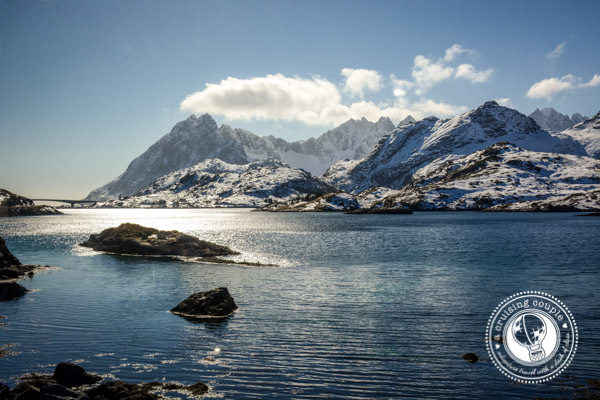 Lofoten has amazing opportunities for surfing, climbing, hiking, fishing, scuba diving, kayaking and cycling. Basically, if you enjoy active travel in spectacular places, you can’t go wrong. In one sense we were a bit grateful for the thunderstorms and wind during our stay as it enforced us to hibernate in our cozy abode and get a bit of work done. But to really get the most out of Lofoten, you need clear skies. We’ve already claimed that Norway is the most beautiful country we’ve ever visited. And if we have to choose one place in Norway that takes 1st for jaw-dropping scenery, it’s easily the Lofoten Islands. We don’t think there’s anywhere else on Earth quite like it. 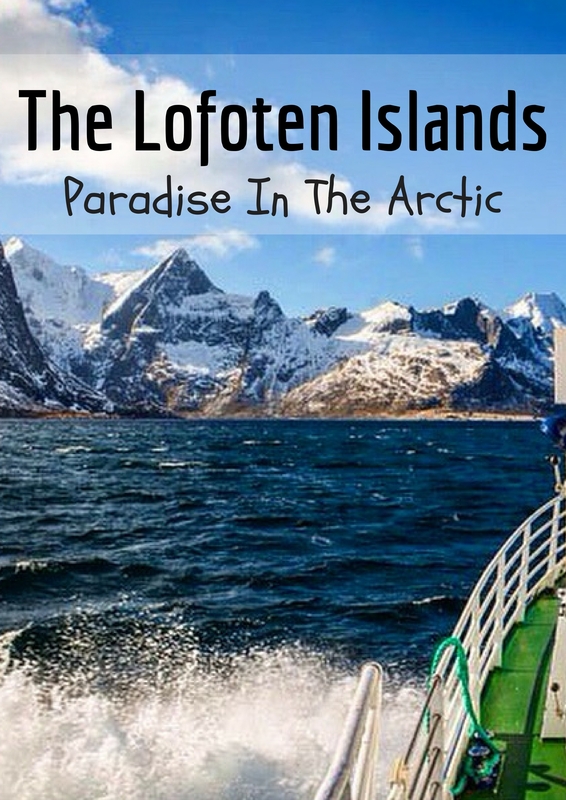 Had you heard of the Lofoten Islands before? Have you ever been? Want to go now? As always, we appreciate all thoughts and opinions in the comment section below! We were guests of Eliassen Rorbuer. All thoughts and opinions are— as always—our own. The Lofoten Islands are by far the most beautiful region I have been to. Exactly a year ago now, I was exploring the islands by bicycle. Best time of my life! I can’t even imagine how amazing it must have been to explore them via bicycle! We tried to cycle one day, but the wind was just too rough for us. We hope to return one year over the summer though so we can do more climbing/cycling/hiking. The scenery is just unbelievable! These islands look absolutely stunning. I particularly love the fisherman cabins, they are so unusual standing half on land and half in the water. Thanks Franca! The fisherman cabins were the best- so quaint, and they really added to the overall vibe and characteristics of the islands! Haha we are SO ready to sweat. We’re still in boots and scarves, which is not typical for us at all! This post makes me feel a little bit colder now :). China’s been way too hot these days. Great adventure I must admit and the scenery’s so breath-taking. I would definitely rent a car to visit Eliassen Rorbuer. How expensive is this place? Would it be possible to do couchsurfing there? 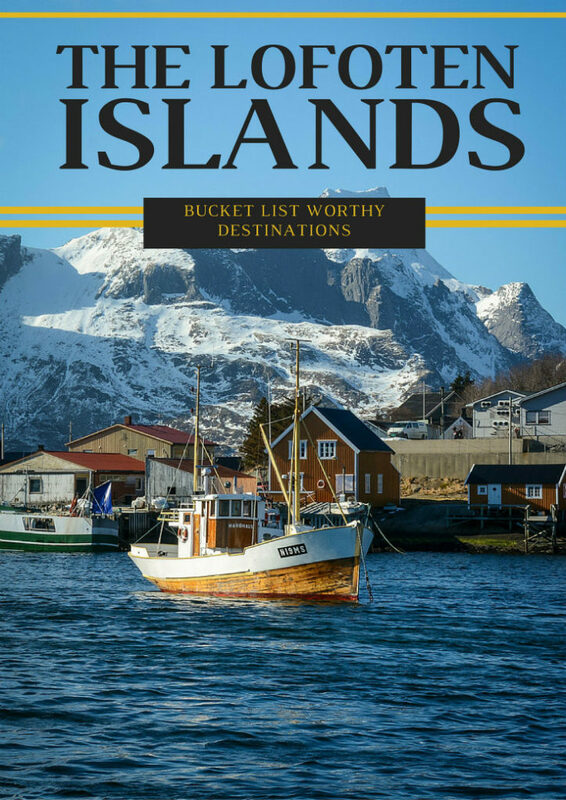 That is SO awesome that you have an island bucket list! Lofoten has to be on them, then :) We really want to go to Iceland. Hopefully on our next trip to Europe! Casey, Um. Yes, please. How did you get there, by ferry or air? It would have been wonderful to have a fireplace…but then you might not have ever left, right? It looks gorgeous! No, I’d not heard of them. This is a trip I’d love to take! Beautiful pictures. We’ll be passing through the Lofoten Islands in a few days time so I’m excited to see them for myself. I sooo hope we get the weather! Couldn’t agree more. The Lofoten Islands are stunning. We recently spent 5 days with our friend Trgve who lives in Henningsvaer in the Lofoten Islands. Our first day of exploring the islands was fine and sunny. The other days not so fine but was good to experience the moody cloudy atmosphere over the fishing villages. We had the same experience with the weather as well. Luckily we got to snap a couple of photos before the clouds and rain set in. It is nice to experience both sides though. The Lofotens definitely have a special mood in the wind and fog. This is a GREAT post. I love that you didn’t just sling a pile of photos up with brief descriptions. It’s a *real* travel post with useful information for your readers, and I’m sure they appreciate that. These photos are outstanding. I LOVE me some mainland Norway but now I really need to explore some of its isles (other than Spitsbergen, which I’ve been to)! What a beautiful place! I’d never even heard of the Lofoten Islands before this. 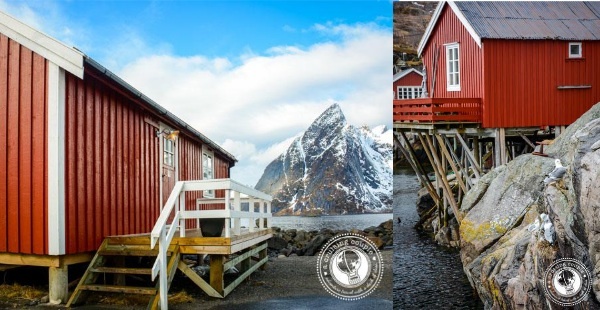 I’d love a chance to stay in one of the traditional red fisherman cabins sometime! It was really special to be able to stay in a traditional cabin and really get a feel for what life must be like for the fisherman there. Bethaney – Flashpacker Family recently posted…Help Plan Our Summer Travels! I’ve never been to Newfoundland but it has that raw Alaska wilderness feeling to it for sure! Wow, an arctic paradise indeed! Those little red cabins are so picturesque! Our parents just returned from Norway. Pretty sure they didn’t make it this far north, though. They surely would have told us if they did. Loving these photos, guys. You’re not going to believe this, guys. We just checked the postcard we received from them. They only sent it in Lofoten. Spooky. Beautiful photos! 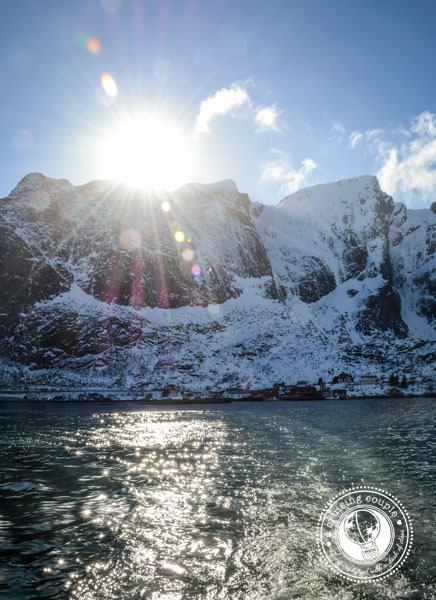 I’m glad you were fortunate to have blue sky during your time in the Lofoten Islands. We’re headed to Norway tomorrow and wish we had more time to head to the northern part of the country. Thanks so much for sharing! You managed to grab some mighty inviting photos on your one day with good weather.! 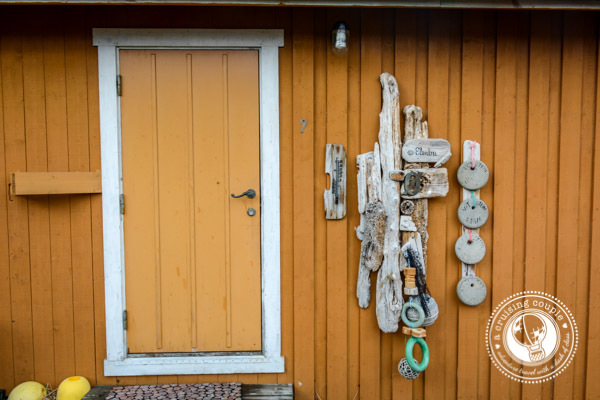 Staying in a fisherman’s cabin sounds like the way to go. We had heard all the stories so when the weather was good we took full advantage of it :-) The fisherman’s cabin is such a special touch too! I agree. This place is absolutely gorgeous. I spent a few days exploring Reine, Å, and Svolvær. I have to say that Reine is the most beautiful, indeed.